The rest of us can still look at awesome comic book cakes and dream, right? Look at this gorgeous Wonder Woman cake! LOOK AT IT. Because na na na na na na... BATMAN! LOVE this design; so much impact for a (relatively) simple silhouette. But maybe you prefer the Dark Knight a little less... dark? Pretty piles of punchy pink, Batman! You know, this color combo is really starting to grow on me. I admire your restraint, Elijah; I'd be gnawing on Hulk's elbow by now. Anyone else excited about the new Supergirl series coming this Fall? And I love that Rocket! Awwwwesome. The colors, the ascending dot pattern, the perfect overlapping covers - it's ALL good. And another classic: Wonder Woman! Not exactly a superhero, but you have to see this fun comic book/pop art cake, made entirely with buttercream! C'mon. How fun is this?? Joker & Harley wedding cake. Happy Sunday, guys! Hope those of you at SDCC are having fun! I'm always a bit uncomfortable with couples comparing themselves to Joker and Harley... it's right up there with Romeo and Juliet in "famous fictional couples you shouldn't actually seek to emulate IN ANY WAY WHATSOEVER"
That being said, the cake's nice. Jacinda Russ made the Batman cake! Oh god, I can't not see the pop art cake as toes with toenails. Sorry. I'm just happy some of these are for kids who appreciate classic comics, or maybe their cartoons. However, I'm especially happy that some little girls who like pastels (and their parents) also like classic comics and can combine the two without their heads exploding. They are going to have the whole wide world open to them. I'm with Amy on the toe thing! Right there with Amy and Karen....can't not see those oozing toes on the pop art cake. Everything else is stunning though. Jacinda is not a professional baker, so she doesn't have a website. I know that's her cake because she baked it for a friend of mine. My favorite part out of all of those is the FIRST layer of the LAST cake. The pink "M" inside of the "Superman" diamond shape (with stars shooting outward from it) is just...I can't SEE straight, thinking of some sweet little girl getting that special surprise...!!! She'll probably never forget that cake. GASP!!!! Wonder Woman is incredible!!! I NEED that first cake in my life..
Am I the only one seeing melting feet for the art one? @Gristle McNerd, I totally agree with you. Romeo and Juliet is my least favorite play by Shakespeare. And I think I'd be uncomfortable at a wedding where Joker and Harley are the theme - I'd keep expecting something to blow up! But the cake is super cute! Honestly, I think Joker and Harley is way worse than Romeo and Juliet. R&J were just kinda young and stupid, and if they'd survived their tragic circumstances they probably would have had a reasonably healthy relationship. Joker, however, is consistently abusive to Harley. Heck, my understanding is that in the comics she has now left him, and stated in her own words that the relationship was abusive. It's a lovely cake artistically, but the implications make me cringe. Those cakes look so good it would darn near break my heart to cut into them and eat them. THANK GOD I am not the only person who saw melting feet with toenails!!! The rest are so well done, but that one made me nauseated. Thanks for sharing those superheros, you remind me my child hood. Those "descending dots" Halftone dots. The uniform dots on the...um..."toe cake" are known as Ben-Day dots. Yay printing! I think Elijah and his mom are totally mid lunge to gnaw on Hulk. Great cake! Some days you just can't get rid of a bomb (cake). For the last cake, is the top tier a Mario reference? The bomb could be from the game and is the crown the princess's crown (I can't remember her name)? You can find the Batman Cake on different sites in the internet. The cake is cute, but DEAR GOD DON'T HAVE A HARLEY/JOKER TOPPER. I mean, he hurls her through a window to her near-death... in the freakin' cartoon. You know, for kids! It just seems like the worst of omens. I love love LOVE both the Wonder Woman cakes! And the 2nd cake, the Dark Batman. very cool. 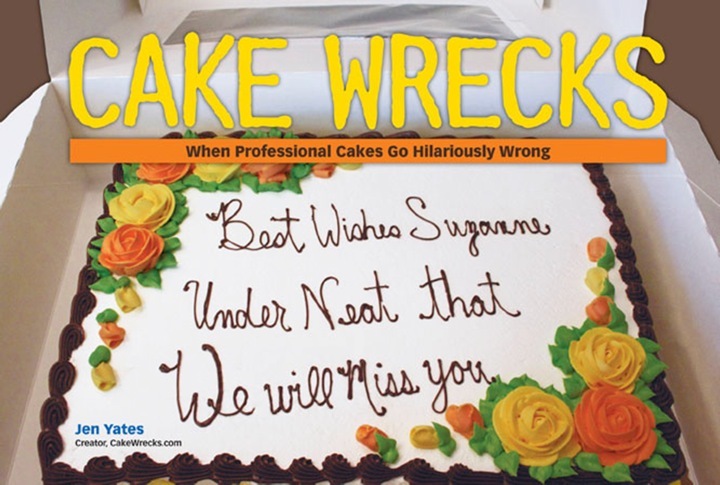 I have been enjoying Cake Wrecks and Sunday Sweets for awhile and just commented today. Thanks for all the posts, the wrecks and the beautiful cakes, too! Thanks so much for including our cake on Sweet Sundays- what a great surprise! I loved designing the Super Hero cake for a little girl, and loved that the clients were not going with the usual red, yellow and blue theme. To answer "Claire's" question, the crown is Wonder Woman's crown, and the bomb is in reference to every cartoon and comic that every had a bad guy! (e.g. original Batman comics to even The Road Runner). Many thanks, Leah- Cake Me To Your Party, Australia.